We offer Invisalign clear braces in Gahanna OH. Invisalign is a series of clear, removable teeth aligners that our Gahanna Invisalign dentists use as an alternative to traditional metal dental braces. 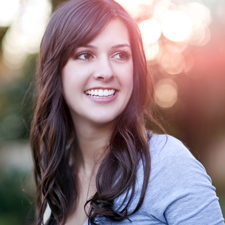 Consider using Invisalign to get the beautiful straight teeth you've always wanted — without braces. A complimentary consultation is available with our Gahanna Invisalign dentist to find out if Invisalign Clear Braces are right for you. Misaligned teeth can cause difficulties with speaking and eating, as well as keep your smile from looking its best. Comfortable, removable and nearly invisible, Invisalign Clear Braces offered at our convenient offices in Gahanna , can straighten your teeth without the conspicuous appearance of traditional metal braces. Rather than bonding irritating metal braces to your teeth, our dentists will provide you with a set of custom-molded Invisalign aligners that will gradually reposition your teeth without disrupting your lifestyle — simply remove the aligners to eat, brush, and floss. To learn more about Gahanna invisalign dentist Dawn Baker DDS or to request an appointment, please contact us here or call our office directly at (614) 475-7580.